Between March 25th and April 3rd, all 9th graders in Health/PE classes this semester will be viewing the SOS (Signs of Suicide) suicide prevention presentation. Please be aware that students will be viewing sensitive materials. Information regarding the presentation has been distributed through Health/PE classes. If you have concerns about your child's safety, please contact your child's counselor immediately for additional resources or call your nearest emergency room after school hours. For more information about the SOS program and suicide prevention resources, please visit the following website: https://sossignsofsuicide.org (Username: ghhs-par and Password: wakeSOS). No matter what problems you are dealing with, we want to help you! By calling 1-800-273-TALK (8255) you’ll be connected to a skilled, trained counselor at a crisis center in your area, anytime 24/7. Similar to first aid, Mental Health First Aid teaches participants how to respond to mental health crises, such as depression, anxiety, and more. Mental health crises are common, and NCPTA is pleased to host a youth Mental Health First Aid training on November 30. This training is perfect for parents, volunteers, teachers, or anyone who spends time around kids. Additional information and registration will be available on our website in October. The YMHFA course is 8 hours in length, and participants earn a certificate upon completion. If your school, organization, agency or faith community is interested in hosting the program, trainers can be sought out in your area to facilitate the program, or as an individual, you can join an already scheduled training. 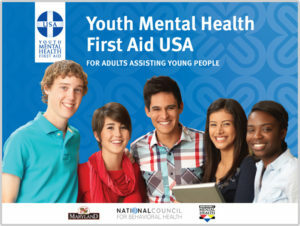 To find a trainer or course in your area visit: http://www.mentalhealthfirstaid.org/cs/take-a-course/ and join the other 7, 771 youth first aiders in our state to change the narrative.